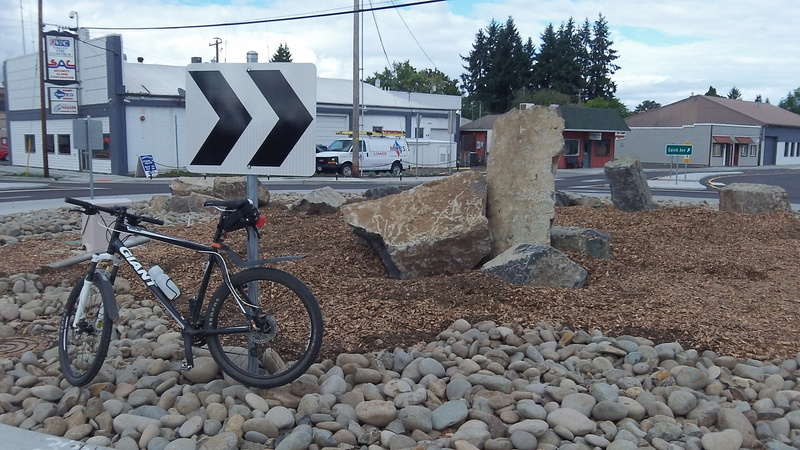 The way these rocks are being arranged inside Albany’s Main Street roundabout, it’s inevitable that we’re going to call it Stonehenge. But far from being the ancient artifact of a long-dead civilization, the arrangement is brand new this week. The way many of us have been going on about roundabouts, especially this one, it’s impossible not to note this latest step in its development and construction. This, Albany’s third major roundabout and fifth altogether (unless I missed one), was finished as part of the Main Street rehabilitation project almost exactly a year ago. After prolonged public discussions about what should go in its center, the city wisely decided to go with landscaping instead of anything more elaborate, symbolic or expensive. As I reported in July, the city then was about to award a landscaping contract to Anderson’s Erosion Control Inc. of Junction City, whose bid of $31,490 was the lower of two. As expected, the contractor evidently waited for cooler weather to start the job this week. Among other things, the bid specifications called for placing 30 boulders up to 4.5 feet tall plus another 30 rocks about two feet tall. On Wednesday night some of the rocks were in place, as you can see. An assortment of plants was to follow, and the company has until Sept. 18 to finish the job. I think low maintenance and low water consumption is the way to go . I think it’ll look great when done and will be proud addition to my neighborhood . I agree with the previous comment. Interesting choice of landscape materials which, when finished should look nice but not so nice as to take your eye off the road for too long. Any bets on how long it takes for the first drunk to get their car impaled on one of those rocks?? Or a 53 ft t semi truck/trailer following his car size garman instead of a truck tailored one getting hung up trying to make the curve? Hadn’t thought about vandalism before, but I can see the attraction of the large rocks to spray painters now. I guess we’ll see. Weeds will need to be controlled with regular applications of herbicide, perhaps no more costly than arranging watering and weeding if it were just a plot of grass. Objects to strike in the center island that are not forgiving will need to be changed. As for trucks, modern roundabouts are designed for trucks, large vehicles, and trailer towing vehicles by including the center flat area around the circle. It’s not a sidewalk, it’s called a truck apron, and it’s for trucks to begin a sharp right or end a left or U-turn on. I live closeby to this roundabout and use it daily and often and though once a naysayer to the roundabout concept, I am totally sold on it now. It’s hard now to remember just what a choke point and danger this intersection was pre-roundabout. It’s interesting to read the comments in the Corvallis paper regarding their new roundabout on 53rd/West Hills…another one I use regularly…..Apparently the “progressives” in Corvallis are having a harder time adjusting to this relatively new traffic control device. One can only wonder about some people……it is so simple and safe. I finally rode through this today on my bicycle. I am heading North on Main to make a right turn onto Salem. I find the rocks obscure my vision to some extent. If they plant vegetation between the rocks, I feel it will make things hazardous, since smaller, sportier cars (which are likely to be traveling faster) will be much more difficult to see from the opposite side. Things wouldn’t be as bad, but the bike lane disappears once you enter the roundabout, putting you in front of a potentially fast moving car.